As part of the Creation Care team I was asked if I would be able to talk to the Monday club on ways to be ‘Greener’ around the home. I was able to take an extended lunch break from my ‘day job’ just across the road at Anne of Cleves House and Museum, where I am immersed in all things ‘Tudor’. I had recently led some workshops at Lewes Priory Park at the launch of the Priory Trust’s kitchen garden on Medieval Colour and Scent, focussing on dye plants and strewing herbs. This led me to recall the words of Winston Churchill ‘The further back one looks, the further forward one may see’. In other words we can learn from the past. I thought this would be a good opportunity to look at how herbs can be used around the house and garden today as an opportunity to reduce the use of nasty chemicals that go on to pollute the air, waterways and harm the environment. In days gone by, herbs were central to household economies not just for flavouring and preserving food or for providing medicines but also for jobs around the house and garden. Herbs were incorporated in to roof thatch, they were used to cover floors, to clean, polish and disinfect utensils and to sweeten and purify musty air. 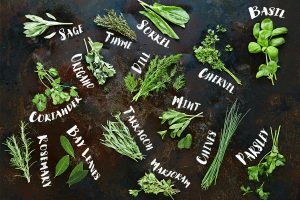 It is not just historical interest or nostalgia that makes the idea of using herbs attractive to us today. Herbal dyes are still unsurpassed for subtlety of colour and aromatic herbs contain antiseptic oils useful for cleaning. But beyond this the fresh fragrance of herbs has a way of pushing our thoughts past the strictly utilitarian. To fold sheets scented with lavender water or to polish furniture with sweet marjoram scented wax changes the chore to a pleasure. Perhaps it reminds us of the seasons or gives us a sense of continuity with the past. Whatever the reason herbalists through the ages have told us that fresh sweet scents will lift our spirits and modern research confirms this assertion. 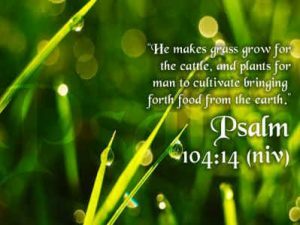 The Psalms tell us that God has given us “herbs for the service of man.” Ps.104:14.
erb is any plant with leaves, seeds, or flowers used for flavouring, food, medicine, or perfume. Usually we think of a relatively small range of plants that are used for culinary purposes such as Thyme, Coriander, Sage, Parsley, Rosemary, Mint, Basil and Chives. Yet John Parkinson’s ‘Herbal’ ( A herbal was a book describing plants and their uses) of 1640 contains accounts of 3800 herbs. Written herbals were produced in Britain as early as the 10th Century and initially the Medieval Church encouraged scientific enquiry as a means of glorifying and becoming closer to God (and while this attitude was to change as the centuries progressed it is certainly something I could agree with today.) The monasteries became centres for learning and research, cultivating physic gardens and introducing new plants. If you get a chance it is worth going to look at both the Lewes Priory herb garden and the new Medieval Vegetable Garden. Today the growing of herbs also brings their benefits to the garden. 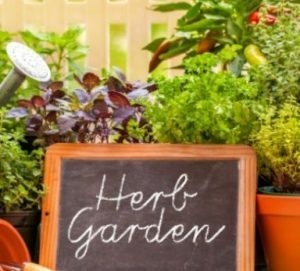 Herb gardens, not only look colourful and are relatively easy to maintain. Many herbs can be grown as companion plants helping to control pests and diseases. Herbs can easily be grown even if you only have a balcony, patio or window box. Many of them will take to being grown on the window sill .Herbs can be used in cooking, are fantastic in attracting pollinating insects such as bees and hoverflies, and provide a great nectar source for butterflies and moths. Interestingly although herbs attract ‘good’ insects they can also be used to prevent ‘bad’ ones causing problems. One of the most important uses of herbs in Tudor times was for Strewing, where herbs would be thrown (strewn)on to rushes or straw used to cover the floors of houses and halls, in place of carpets. As well as smelling nice many herbs could repel insects and some had disinfectant properties. Some herbs would help to keep flies, moths, and other insects and even mice away. Of course, Strewing of herbs is not practical today, but bunches of herbs can be hung in the kitchen, in wardrobes or placed in draws to keep insects away and to make everywhere smell pleasant. There are many books on herbs concentrating on culinary or medicinal herbs but here I’d like to look at other ways that God has provided herbs for the service of man. Below is a list of herbs some are mentioned in the bible, others have religious stories or legends attached but all of them can be put to use in the home today. 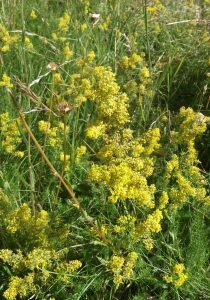 Lady’s Bedstraw, Light green sprawling fluffy herb with clusters of airy yellow flowers. as the name suggests was used to stuff pillows and mattresses. It kills fleas and the roots also provide a red dye. Mary is said to have prepared the Christ child’s bed with this herb. Thereafter it was known as Our Lady’s Bedstraw, and the formerly white flower-heads turned to a golden hue. “And she gave birth to her firstborn son and wrapped him in bands of cloth, and laid him in a manger. There is quite a lot growing in the South churchyard at Southover . Penny Royal, a type of low growing mint, also known as fleabane kills insects especially fleas, deters ants and repels ticks along with chamomile it was planted in turf benches, when sat on released their fragrances. You can see a turf bench at the new Lewes priory trust kitchen garden in Priory Park. 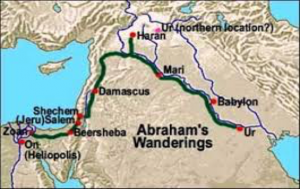 Wormwood, In Jeremiah 23: 15 wicked prophets are threatened with wormwood to eat and poisoned water to drink. Hyssop, is fragrant and is the sacred and cleansing herb of the Bible. When Jesus hung on the cross he said he was thirst and they held a sponge with vinegar on hyssop to his mouth. John 19:29. I like to use hyssop along with sage, thyme, rosemary and lavender in four Thieves vinegar, so called as , according to legend thieves robbing the bodies of plague victims warded off the black death with this. Presumably the herbs used would help prevent the fleas that spread plague. It now can be used as an excellent salad dressing. 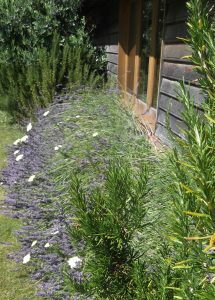 Rosemary often strewn in churches. Not only does it kill and repel insects, leaves and a stem boiled in water for 10 minutes provides a disinfectant. The less water the stronger the disinfectant. This can be used for cleaning taps and sinks in the bathroom and scenting other parts of the house. Sage, thyme and Lavender can also be used this way. Branches of fresh Rosemary in a room can cool the air. Stems can be used as barbecue skewers. For centuries people thought that rosemary plants would grow no higher than 6 feet in 33 years so as not to stand taller than Christ. Another Story tells that the flowers were all originally white but changed to blue when the Virgin Mary hung her cloak on a bush while fleeing from Herod’s soldiers with the Christ child. In medieval times it was burned to cleanse the altar. And was added to love sachets or place under the bed and above the door to protect from harm. Besides the historic uses, rosemary is best known for remembrance and friendship. Soapwort- just cover in soft water (rain) and boil for 30 minutes then use soapy liquid to wash and revive delicate and fabrics. 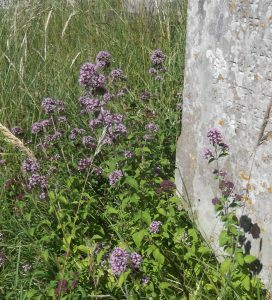 Sweet Marjoram and Oregano a good plant for attracting bees and pollinating insects, it also grows in Southover Churchyarduse pulverised leaves or add a strong decoction to furniture polish. Grow to attract bees and butterflies. Sorrel juice can be used to bleach rust, mould and ink stains from linen, wicker and silver. This is just a short list of some of the many beneficial herbs that can be used around the house. 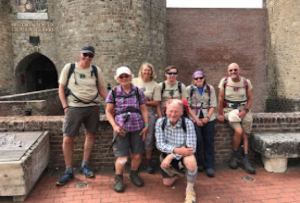 The season of holidays is upon us and for many of us that means a chance to put our feet up in the sunshine – unless of course you’re off on a mountain climbing holiday or cycling across Europe – but then that does rather depend how you define ‘rest’! As we head off on family holiday next week I’ve been thinking again about what it means to rest, or to take Sabbath. In fact when God created man, he did so on the sixth day. So for Adam and Eve the first full day they have on earth they spend resting. That’s BEFORE they do any work. And God does have work for them, he created them to work in and look after the garden (and whether you take Genesis literally or metaphorcially, it’s still clearly showing rest before work). And yet for many of us, it’s rarely that way is it? When do we rest? It is a biblical principal and even if it weren’t I think we’d all agree we need regular breaks, rests or a holiday from all the ‘creating’ we do. Where do you get your rest? How do you get your rest? A rather wise spiritual director once told me that I should learn what things energise me and what sap my energy, in those I would find the balance between work, rest and play (to quote a once well know chocolate ad). In this 21st century world, getting real rest is not easy is it? There is always something to do. Even for Christians, actually having a Sabbath, a day of rest, is almost impossible. 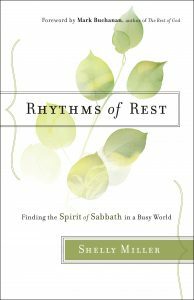 A friend of mine, Shelly Miller, wrote about Sabbath in her books “Rhythms of Rest” which helps us to look at ways to find rest in modern society. And I really think it is a word for our time, in the West we are entrenched in a society that is obsessed with working, with filling every hour, with being busy and ‘doing’. I made a vow a while back to stop saying ‘I am busy’ and not using it as an excuse. If we are too busy then that can’t be right, it can’t be what God intended, after all he is the author of time, something I am reminded of on a regular basis! And of course that’s what Sabbath is all about, not just rest, but time to rest with God. 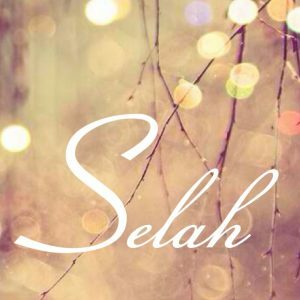 One of my favourite words in the bible is ‘Selah’. We don’t truly know the meaning of the word, but the description I favour most is one that suggests a pause or rest, a break in proceedings to reflect. Probably a musical term or an indication to musicians, it features throughout the Psalms and one can imagine perhaps a stop to take a breath before continuing. It’s a word that has really spoken to me, it says something of rest but also of reflecting on where God is in our rest and in our lives. I even had it tattooed onto my wrist to remind me to take those Selah moments more often. But even as I try to work that into my day, my week, there is also something so necessary about a complete and utter rest. Complete rest from work, from the distractions at home, the to-do lists and jobs, and to have space in our lives and in our minds to rest. And often I find that in those times of giving myself space, I see God more clearly, I can see the way ahead more clearly.